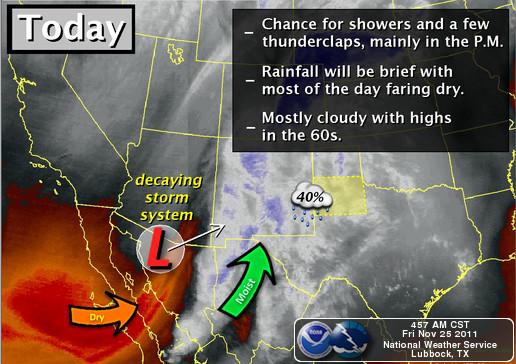 Cloudy Skies - Scattered Rains Showers & T-Storms. Blog updated at 10:00 AM MST. "My SE NM Radar" at 8:52 AM MST. 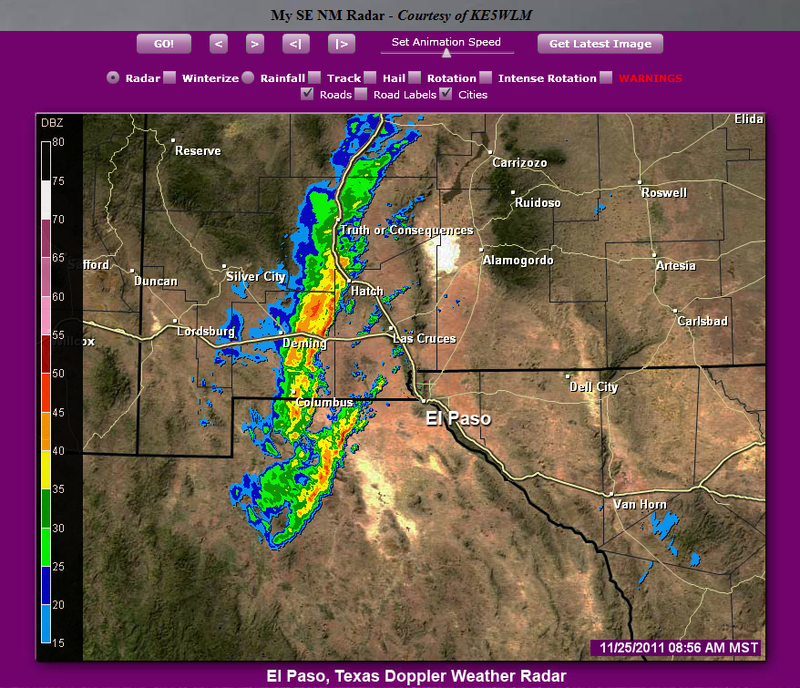 "My SE NM Radar" at 8:56 AM MST. 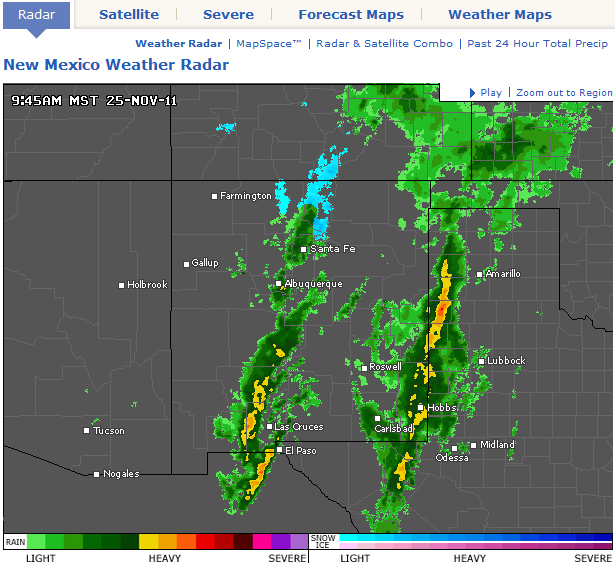 9:45 AM NM Radar View Courtesy Of AccuWeather. 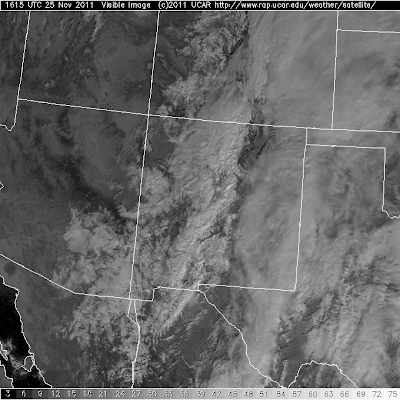 Visible Satellite Image Of New Mexico At 9:15 AM MST. Cloudy skies and scattered light rain showers dot the landscape across the area this morning. Current radar views show two bands of rain showers, and embedded thunderstorms moving across southern and southeastern New Mexico. The heaviest rains are falling just east of Carlsbad as of 9:00 AM. 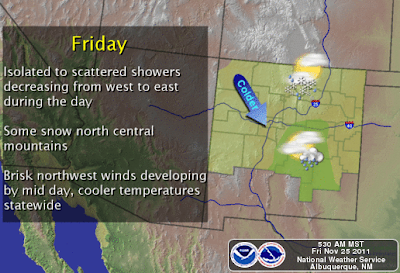 The second band moving eastward across southern New Mexico is associated with the Pacific cold front, and will arrive in the local area this afternoon. 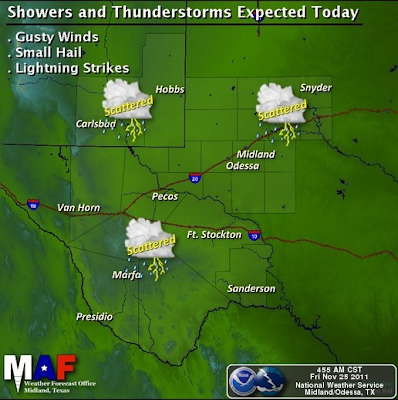 A few of the stronger thunderstorms will be capable of producing gusty winds and small hail today. As was expected the heaviest rains have fallen across southwestern New Mexico. The Deming Airport has picked up 1.31" of rain so far. Cloverdale which is located in extreme southwestern New Mexico has measured 1.35" of rain, while San Lorenzo which is located northeast of Silver City, has picked up 1.00". As of 9:00 AM MST the Ski Apache Ski Resort is reporting that they have picked up 3" of snow. 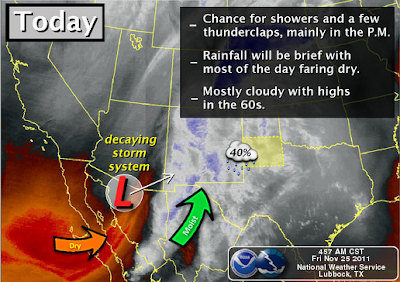 15 Miles NW of Carrizozo .43"
2.3 Miles S of Cloudcroft .24"
4.6 Miles N of Alamogordo .18"
Mescal Raws - Near Mescalero .15"
Sacramento Peak - Sunspot .10"
Holloman AFB - Alamogordo .09"
Please click on this link provided by the Albuquerque National Weather Service Office for a listing of the rainfall and snowfall totals that are coming in across their county warning area of the state. 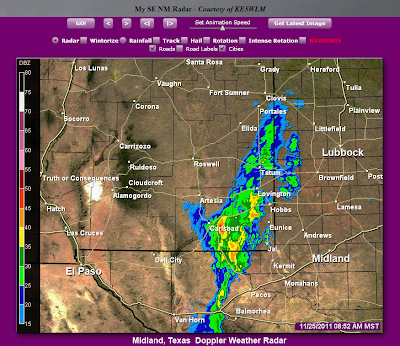 Other rainfall totals can be found at these links: New Mexico MesoWest Weather, Weather Underground, and Davis WeatherLink. Scattered rain showers along with an occasional embedded thunderstorm or two will continue off and on across the area through late this afternoon. As the Pacific cold front sweeps eastward across the area later this afternoon, our skies will clear as the rain moves east into West Texas. Gusty westerly winds will accompany the frontal passage. Our forecast highs today are in the 60's, and depending upon when the clearing occurs, these readings temps could end up being a little high. 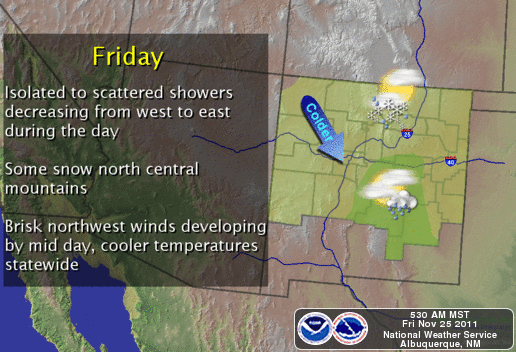 Saturday will be much cooler across the area behind the frontal passage. 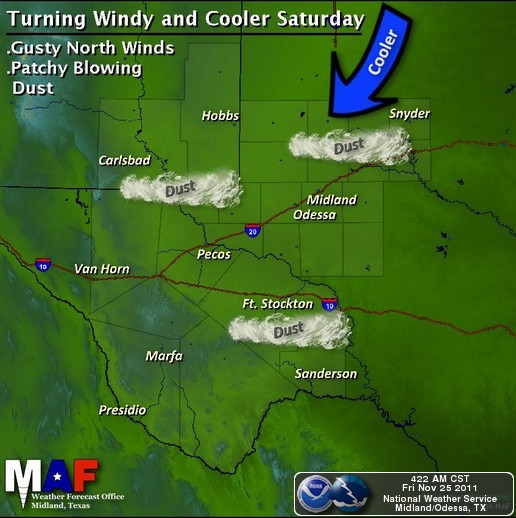 Strong gusty northerly winds sustained at around 30 mph, with gusts near 50 mph will be possible across parts of the area Saturday morning into the early afternoon. 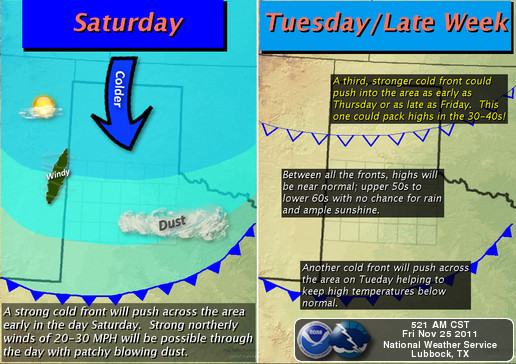 Depending upon how much rain we receive today, areas of blowing dust could also develop in these strong winds tomorrow. 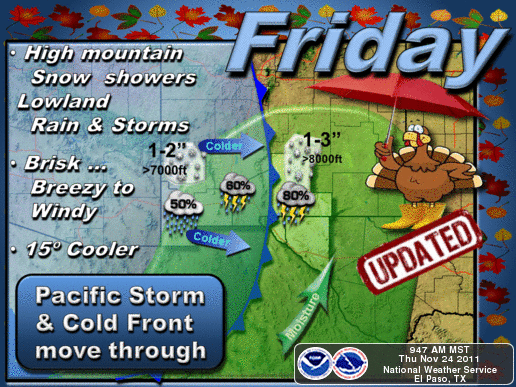 Our highs are forecast to be in the 50's. Clearing skies, light winds, and a dry airmass in place, will allow our temperatures to tumble Saturday night into Sunday morning. Our lows will generally be in the mid-upper 20's. A few places could see lows near 20.